Are you having issues with your electrical systems and onboard monitors? Electronics are complex systems that sometimes have surprisingly simple fixes. This handy home marine electronics repair troubleshooting tips can help you identify the issue quickly. Often times the most obvious things are overlooked. If your electronics don’t work or cut in and out, check to make sure everything is plugged in and there are no damaged wires. Frayed wires and loose connectors are simple and easy to repair. Don’t forget to check that the battery connections are firm and unmoving and that the cables running to the engine are undamaged. This may be something you want to leave to the professionals unless you feel comfortable following the instructions and installation manual. 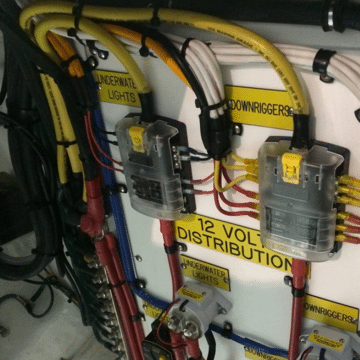 In addition to the basic systems, ensure any marine accessories like additional lights, chart plotters, and GPS units tied into your existing electrical systems have been properly connected. Consider having this tip executed by a professional installer. Along with checking for power connections, also check the fuses. Old or broken fuses will prevent your systems starting. If you’re not sure where the fuses are located, or what kind you need, check the owner’s manual or call us. The standard tech recommendation of “turn it off, then turn it on again” often really does work. Disconnect the unit from the main power source to force a shut down. Unlike the factory reset, doing a hard shut down doesn’t wipe any of your information, meaning you don’t need to perform a backup first. Most onboard electrical systems use some sort of computer. Like a home laptop, onboard computers need to be regularly updated to ensure their systems are free from glitches. Just as you automatically update your laptop, make sure you update your onboard systems. If you are updating everything yourself, ensure there’s enough power to last the length of the update, and backup your systems first, so as not to lose valuable information. Remember that any upgrades or accessories you have added can affect the type and frequency of an update. If you know how to use one, a multi-meter is essential to proper marine electronics repair. This tool allows you to isolate where a problem is coming from, letting you know if you can fix the problem yourself or should let a professional handle it. checking the continuity of the electrical flow. It’s essential to know whether your systems are getting power at all or if they’re getting too much power. This is a common problem with older boats that have upgraded to newer systems. For more in-depth information about using a multi-meter, check out this basic guide to get you started. Performing a complete reset back to factory settings is occasionally a necessity. This option should only be used as the last resort because it will completely erase any information you have already installed. Remember to backup all data prior to resetting. We recommend you have a professional do this. 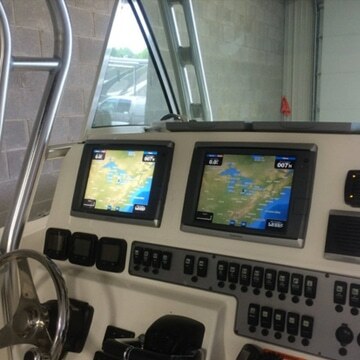 Safety is always a consideration when performing marine electronics repair work. Make sure you are properly insulated from electrical currents and follow instructions on items such as the multi-meter. If you decide you need help, or the job requires professional assistance, at Imagine Marine we offer a range of services will ensure you receive the best service possible.